Playing to Win: Hilary Levey Friedman's new book on our activities-obsessed parenting culture. 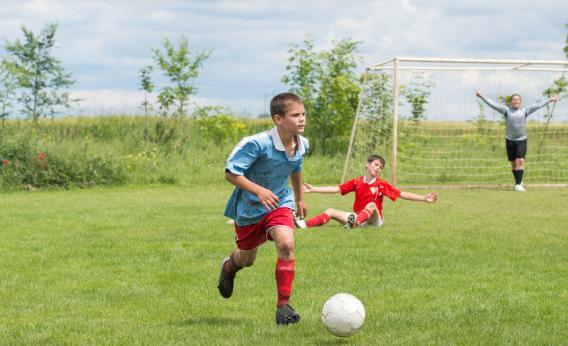 When sociologist and occasional Slate contributor Hilary Levey Friedman started researching her book, Playing to Win: Raising Children in a Competitive Culture, which follows elementary school-age children involved in soccer, chess, and dance, she thought she would balance things out by also tracking some kids who weren’t involved in competitive after-school activities. But in the middle-class world she was reporting on, she couldn’t find any. Though it might seem like overscheduled kids is an obnoxious upper-middle-class phenomenon, Levey Friedman observed lower-middle-class families caught up in the competitive-kid hustle, too. In Playing to Win, Friedman outlines how hypercompetition has exploded since the ‘80s in the U.S., and not just in soccer, chess, and dance. The competitive cheerleading circuit, beauty pageants, youth skateboarding competitions, and even youth golfing have become increasingly popular. I spoke to Friedman, the daughter of a single mom who grew up outside this activities-obsessed middle-class world, about why parents are so caught up in the activities arms race, whether enrolling your children in competitive activities in elementary school gives them an edge in college admissions, and if it bothers moms and dads to spend all of their time driving between soccer games. Slate: You note that kids are being introduced to competition at younger and younger ages. Is there data yet about how this will affect them as teenagers and adults? Hilary Levey Friedman: We don’t have a lot of data on this. But a lot of the psychological research on kids [says] the kids who are busy are actually happier, and kids involved in fewer activities are more likely to exhibit depression. But it’s unclear where the causation is. Kids learn a lot of life skills when they take chess or soccer or dance at a young age. It doesn’t matter if they keep playing chess and are the next Bobby Fisher. Actually, not one of the parents I interviewed wants that. But they do want their kids to go to Princeton. They feel the skills they learn while playing let them achieve that kind of success. There’s a lot of concern about kids burning out in high school or college. Especially in college. One of the most famous cases of this is Amy Chua’s [the Tiger Mom’s] daughter is studying Sanskrit and philosophy at Harvard—not necessarily what would be leading you to the partner track of Goldman Sachs. Slate: One of the quotes from the book that really stood out was the father who worried about how his daughter didn’t know what to do with herself when she wasn’t in an organized activity. He said, “When she’s not in one of those activities, she’s bored. She says it’s boring to sit in the car and do nothing. So I told her, ‘Sara, why don’t you daydream when you are in the car?’ ” Do you worry that a consequence of overscheduled kids is an inability to self-direct? Friedman: I do think that is an important concern. I’d highlight the word creativity. We want a generation who will come up with creative solution in social sciences, sciences, and the arts. My concern is not just kids being bored—it’s literally being unable to occupy yourself, to daydream, to make up games and do imaginative play. And that’s not just competition, but when kids are so scheduled and have so many devices like iPads and so many stimuli, what are we losing? Those things are great, but at the cost of what? Then again, we grew up with TV, and we’re fine. Slate: I was talking to the mother of kids in their early teens recently, and her attitude was: The middle class is constricting, and so I need to push my kids to really achieve, or they are going to be in trouble. Was it your sense that the parents who have kids in competitive activities in elementary school were explicitly thinking that far ahead? Friedman: The way people get into the upper-middle class and upper class now is based on educational credentials. If you’re a doctor, lawyer, or MBA—you can’t pass those on to your kids. You can’t just pass on the family business anymore. Ivanka Trump went to Wharton. I’m sure her name helped, but she still had to go to Wharton. You have to get those credentials. And now, you have to do well in school but also distinguish yourself outside the classroom. Slate: Does participation in these activities actually help kids get into good schools? Friedman: We have some evidence—not quantitative, but qualitative work from people who have [observed] admissions meetings at highly selective liberal arts schools. Certain activities are markers: If you do squash or crew, it marks you as from a family that can pay full tuition. Then it turned into fencing. Now I have a great quote from a dad, [who says] everyone’s figured out fencing—he thinks the X Games type sports are the thing. So his daughters aren’t skiing, they’re snowboarding. That dad himself didn’t go to college. He had a different background and went to Wall Street and made a lot of money, so he was being highly strategic. Slate: Did it bother any of the parents that all of their free time, and all of their family time, was eaten up by carting their kids to soccer games, dance competitions, and chess tournaments? Friedman: The one family I interviewed you’d truly think of as upper class, they have five kids. There are the two parents, and then they have a live-in nanny couple. They have so many activities, that every weekend they’d hire a driver to take their fifth child to practices. There’s one adult for every child. So it’s very complicated, even if you have the resources. This whole family is not spending time together. It’s something I’m worried about too. [But] no one really talked about a lack of their own personal time.